I did not know that the story was inspired by the infamous Manson Family. Although I recognized the likeness to the Manson cult. But the book is more of a coming-of-age story than a crime story. The author has done a good job of getting inside the head of a 14 year old girl. The writing is also very good and strong. The story is told from today were we meet the grown up Evie, and from the past when Evie was 14 years old. She is insecure and longing for love and attention. When she sees a group of girls in a park she is mesmerized. They have an aura of self-assurance and carelessness Evie knows she will never have. She is thrilled when she meets one of them, the enigmatic Suzanne again and is invited to come to the farm where they live. There she meets their leader Russell. Soon Evie becomes attached to the life on the farm and with these strange people. The book is very slow. The story needs some time to enfold. We read a lot about Evie’s life, her thoughts and I found it quite depressing. Some things were very familiar and I understood exactly what Evie was feeling. The feeling that you never get what you want no matter how hard you try and doing things just because you want to be liked or looked at. And the embarrassment afterwards. And this was the problem for me. I was really depressing. And I found it a bit too slow. 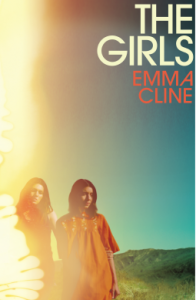 The book is so focused on Evie that the cult and the people on the farm stood in her shadow. I would have loved to read more about them, the fascination that kept them there and with Russell. It’s also quite depressing to read about how women in this book were doing everything for men, for being loved. All the men in the book are egoistic and obscene and just thinking about their needs. They take the women just as objects. There might be some truth in it but I cannot say that I liked it. I think that’s the mayor problem with me and this book: it was not a nice read, I did not enjoy the story although it is an interesting one and very good written. It just depressed me and I sometimes had to force myself reading it. I read a similar book a couple of month ago, Beth Hahn’s “The Singing Bone” which I liked more. It was more gripping and more about the group. So this book is hard to rate for me because I know it is a good book who deserves a lot of readers. I just did not enjoy it.